Hawaii-based Lance Cpl. David Motari is being "processed for separation"
WASHINGTON (CNN) -- A U.S. Marine videotaped throwing a puppy over a cliff while on patrol in Iraq has been kicked out of the Corps, and a second Marine involved has been disciplined, according to a statement released by the Marines. Lance Cpl. David Motari, based in Hawaii with the 1st Battalion, 3rd Marine Regiment, is being "processed for separation" and received non-judicial punishment, officials said in the statement Wednesday night. The Marine Corps would not specify what that punishment was because of privacy regulations. The statement said Motari received the punishment for his role in the "episode which generated international attention." The incident appeared on the Internet web site YouTube in March, sparking outrage from animal rights groups around the world. In the video, Motari is seen throwing the dog off a cliff as it yelps. A second Marine, San Diego-based Sgt. Crismarvin Banez Encarnacion, received non-judicial punishment as well. Janice Hagar, a spokeswoman for the Marines in San Diego, said Encarnacion shot the video. Marine officials at the Pentagon would not disclose the severity of the disciplinary action against Encarnacion, also because of privacy regulations. CNN did not receive a response from the Marine Corps in San Diego to questions about the case. The statement said the Marines conducted an investigation as soon as the YouTube video came to the attention of commanders. "The actions seen in the Internet video are contrary to the high standards we expect of every Marine and will not be tolerated," according to the statement. 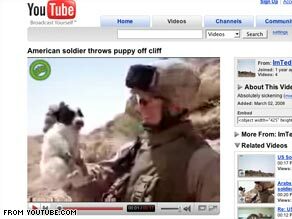 On the video, Motari smiles as he is holding the puppy and then hurls the dog over a cliff. An unknown person operating the video cameras is heard laughing and another voice saying "that's mean, Motari." In a statement, the Humane Society of the United States applauded the Marine Corps' decision to punish those involved. "The bad actors in this case have been dealt with by the Marine Corps, which rightly recognizes that harming animals is unacceptable conduct," said Dale Bartlett, the group's deputy manager for animal cruelty issues. "Now, the Department of Defense and the Congress must step up protection from cruelty for all animals under the law governing military conduct." All About U.S. Marine Corps • YouTube Inc.